Indian Davis Cupper Rohan Bopanna dropped out of the top-10 in the ATP doubles ranking after finishing last along with Pakistani partner Aisam-ul-haq Qureshi in group B of the season-ending finale in London. 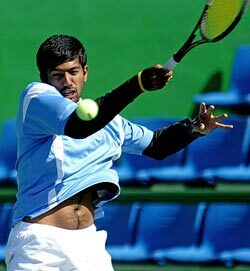 Bopanna and Qureshi lost all the three round-robin matches, which pushed the Indian down one spot to 11th. Leander Paes (8) and Mahesh Bhupathi (7), who made the semi-finals had their rankings unchanged. In the team rankings, Paes and Bhupathi finished the season in fourth position, just ahead of Bopanna-Qureshi combination. In the singles, Somdev Devvarman, who had aimed to break into top-50, ended in 84th position. Sania Mirza, recovering from a knee injury, signed off the WTA season at number 87 the singles and 11 in the doubles list.